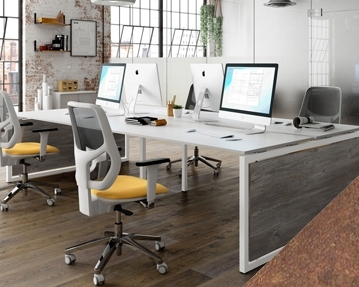 Contemporary workplaces are increasingly moving towards more flexible and dynamic office spaces, and our Lasso range fits in perfectly with this shift. Comprising a series of bench-style desks, Lasso office furniture can be arranged swiftly into any number of open configurations, which makes it great for collaborative work, meetings and fostering creativity amongst a dynamic workforce. Lasso bench desks come with a selection of stylish textured panels, including Concrete, Pitted Steel, Rusted Steel and Platinum Oak. Available in a range of sizes, the sleek lines of the leg frames make Lasso office desks easy to use as standalone workstations or in conjunction with other pieces within the Lasso collection. Desks are equipped with a scalloped cut-out for the easy organisation of cables and phone lines. 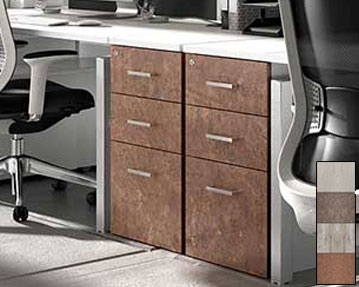 Lasso office desks can be accessorised with lockable pedestals. Other storage options, including cupboards and shelves, are also available in the collection, keeping your workstation neat and clear. Lasso office furniture is made of melamine-faced chipboard, which is lightweight but hardy, and it comes with a 10 year warranty. A fantastic solution to an ever-changing workplace, our Lasso collection is certainly worth a look. If you want to know more, our experts are on hand to offer advice by phone, or why not contact us via our online form?